Proclamation In Council, Dated July 15, 1843, As To Boundaries Of Counties Of Cork And Kerry. 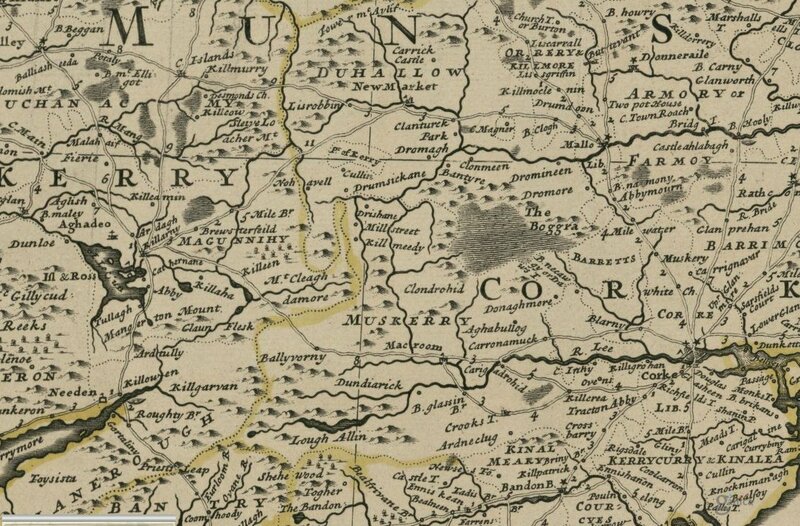 From The Ancient and Present State of the County and City of Cork, by C.
of this parish” (par. of Cullen). From p.26, The Ancient and Present State of the County of Kerry, by. 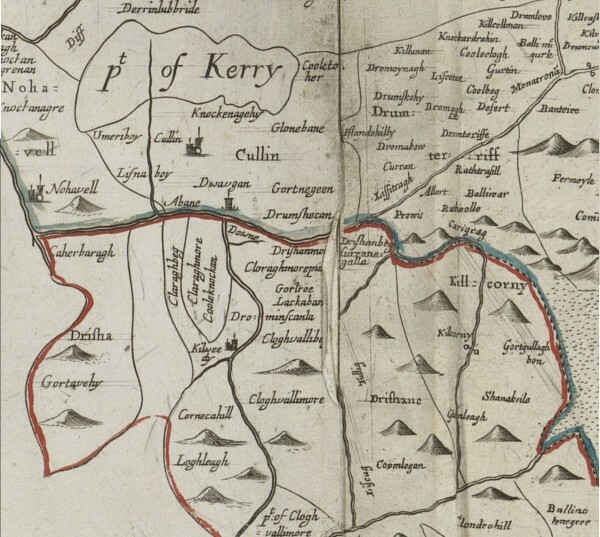 C.
smith, M.D., (1756), reprinted in the O’Kief Series by Dr. Albert Casey, V.
Fitz-Stephen and Milo de Cogan, cited at large in my History of Cork(e). 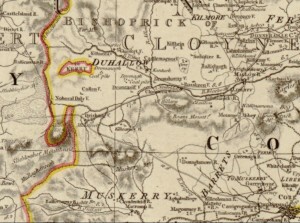 Loumanagh, Doonasleen, Illanbrak, and Ruhill(more). > that was only their port of departure. > maps/files. Thanks in advance. 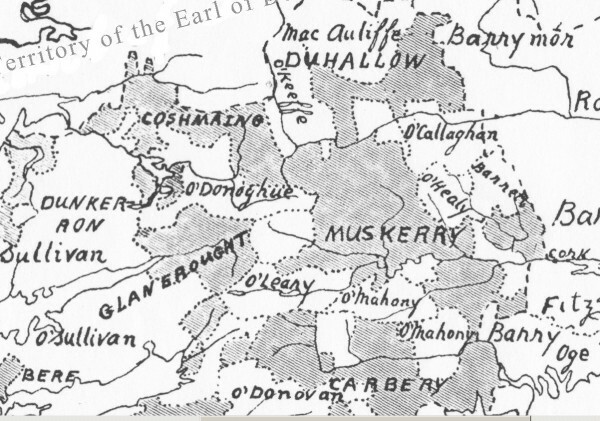 FRACTIONS, EAST and WEST, detached portions of the barony of MAGONIHY, county of KERRY, and province of MUNSTER; the former being locally situated in the parishes of Drishane, Kilmeen, and Nohoval-Daly, in the barony of Duhallow, county of Cork, and the latter in the parishes of Glenbegh and Killorglin, barony of Magonihy, county of Kerry, containing in the whole 5296 inhabitants, of which number, 285 were in Drishane, 1045 in Kilmeen, 1304 in Nohoval-Daly, containing together 2634; and 616 in Glenbegh, and 2046 in Killorglin, together amounting to 2662 inhabitants. In the ecclesiastical divisions they are considered as forming parts of the parishes above enumerated. 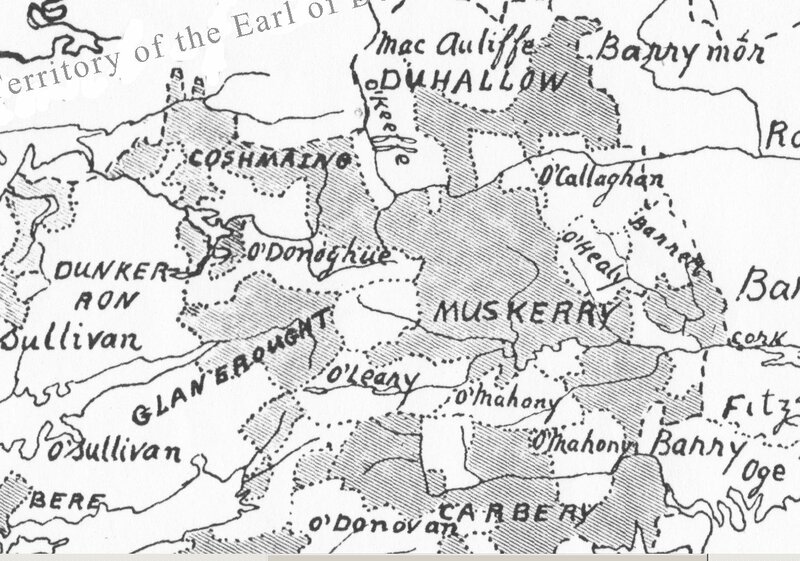 page 12: The diocesan boundaries existed before the county boundaries, which were a Norman innovation. 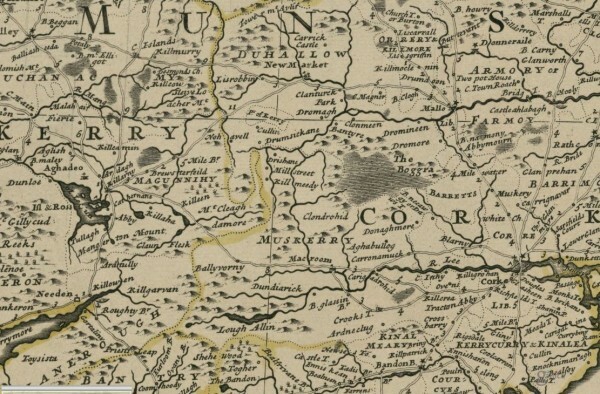 The territory within the diocese was predetermined at least a half a century before the county boundaries were drawn up. However, nothing is ever simple. 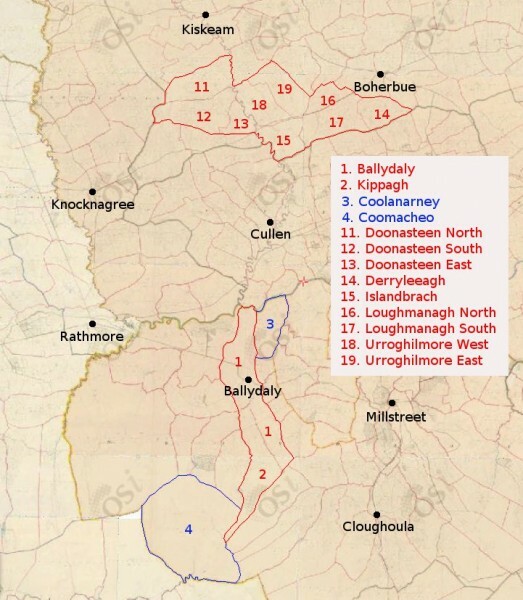 It is further complicated by the fact that the townlands of Ballydaly, Kippagh and Comachoe were regarded as part of the East Fractions of Kerry for about 300 years and the townlands of Shanaknock, Annagloor and Clarathlea were part of the Barony of Duhallow, which extended south of the river Blackwater, as far as Clara mountain. page 26: Fr. Ferris would have said Mass in the ruined Penal church in Ballydaly Upper, located about 250 metres south of Croohig’s cross. We come across him again in information supplied to the Sheriff in June 1714 and an order of capias (let him be arrested) was issued against him on July 17th 1714. Details of the pursuit of this warrant are not forthcoming but in 1715 he had succeeded Anaes Lyne, deceased, in the parish of Kilcolman. 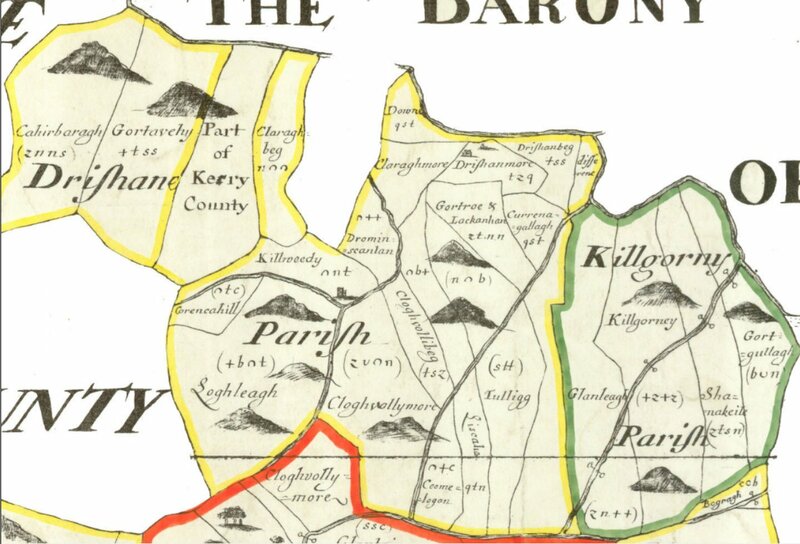 In this instance Ballydaly is called the Parish of West Fractions. The above details are accumulated from State papers at the time and extracts from these can be found in “Irish Priests in Penal Times” by W Burke (1969 p.l49f). I wonder why they were called the Parish of the West Fractions, since they were otherwise referred to as the East Fractions? can anyone help? The Fractions are also seen in the local Down Survey Map from approx 1659 and they would appear to show Coomacheo as part of Kerry County. 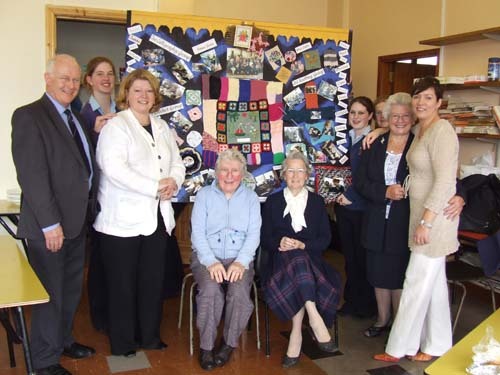 The O’Dalys of Nohoval and Ballydaly. The O’Dalys were the most renowned and fruitful brood of professional poets in this area. They originated in County Westmeath and moved to the Cork/Kerry area in the 12th Century. They became professional poets to the McCarthy Mores and the McCarty Reaghs. In the words of John O’Donovan “There is certainly no family to which the Bardic literature of Ireland is more deeply indebted than to the O’Dalys”. 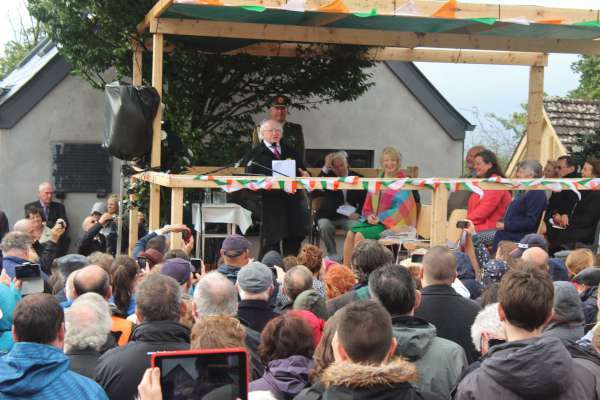 The most prestigious names associated with this area are, Geoffrey and Aengus Fionn O’Dalaigh and Aengus Rua the satirist. Right Brother Reverand Sean O’Connor OSA (Order of Saint Augustine) and Doonasleen wrote a book on the Eastern Fractions. Brother of Mrs Peggy Murphy, Lisnaboy and the late Donal O’Connor MCRVS (Member of the Royal College of Veterinar1y Surgeons). Administrator’s note: The above is a long hand version of the original comment from Denis below which was in shorthand. thanks Denis, would i be right to say that the vet Donal O’Connor you mention was based in Minor Row, Millstreet for many years? 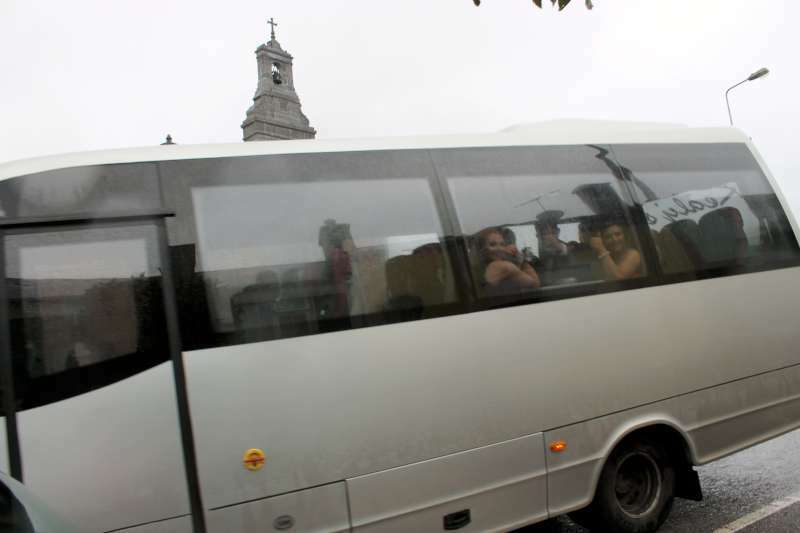 and also that the said Rev Seán O’Connor OSA is now in Dungarvan? by any chance, you don’t know the name of the book, and / or where one might be able to read it? Name: Eastern Fractions. Mrs Peggy Murphy, Lisnaboy, Cullen his sister in Cullen may know more. Fr. Sean has many nieces and nephews in Knocknagree / Cullen area. Also my copy is not accessable now. Thank you to Denis O’Connor for the Forde of Loumanagh Griffith information. 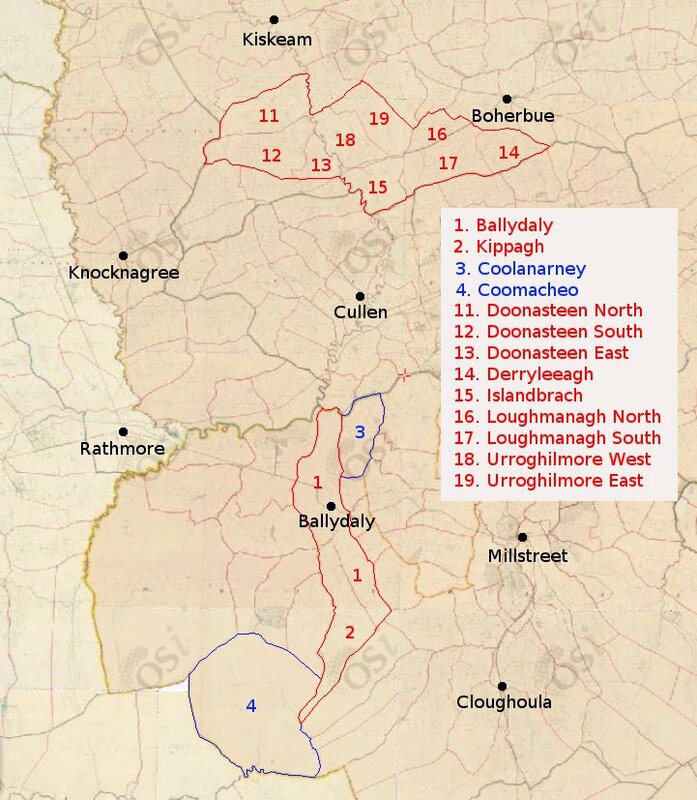 Looking for any information on Forde from Loumanagh townland in the East Fraction. 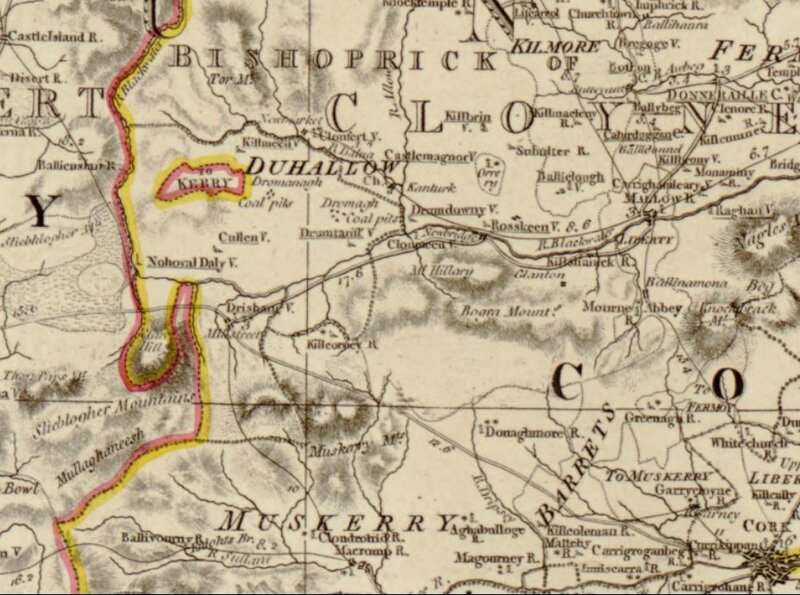 My g. Grandfather Forde was traced to there. Next Post: Next post: Definitely a Morning for Head Attire!